Building Bluetooth enabled control board. Making or selecting car body. 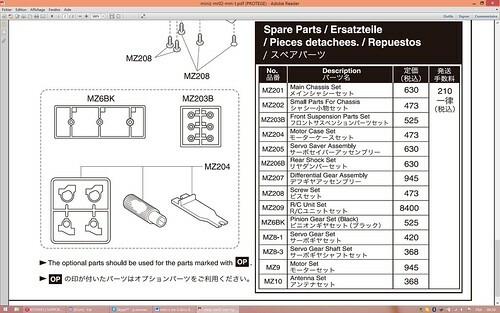 The easiest way of obtaining the required parts list is to download the Mini-Z assembly manual and look into the exploded view page. This page contains the list of all required parts, and, as well, there are some instructions for assembling the car from them. 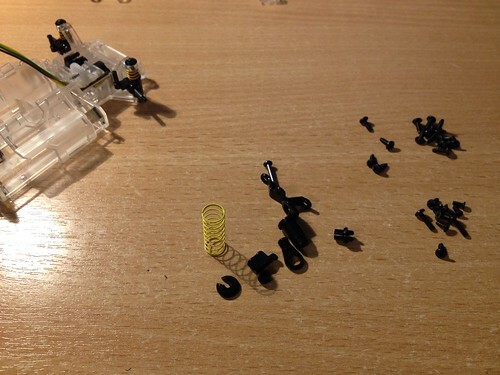 The interesting thing is that, if you own some Mini-Z, you can use some parts from their set (as they usually come with some spares). The assembly manuals could be downloaded from Kyosho manuals page. 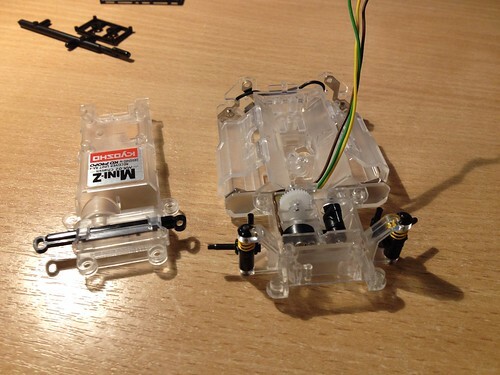 As we are building MR-02 model, the manual of interest is this one: “MINI-Z MR-02 MM”. So we can download the Explored view document and use it: There is a list of parts and some assembly instructions in the page. What this list is lacking is the car body and wheels (they are not included in the parts list). Springs are marked as optional ones in some lists also. For this tutorial we will use our own 3d printed car body. 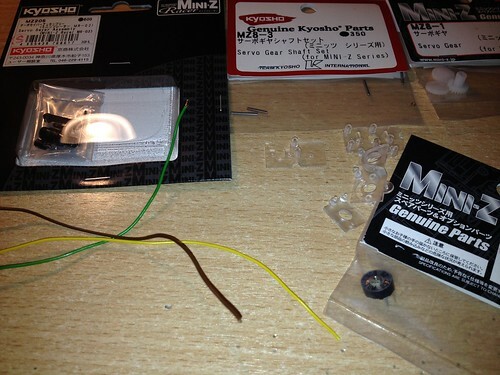 So then we have identified the required parts list, we can just buy them from local hobby shop, or from the on-line shop like this one RC-miniz.com. 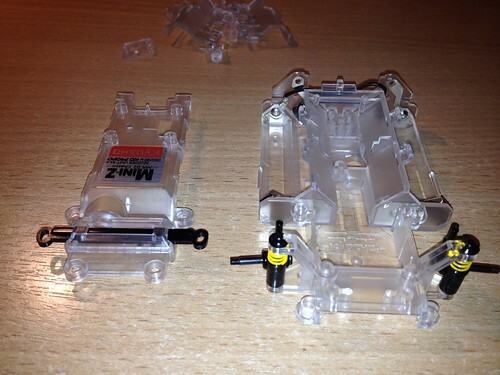 If you already have some Mini-Z, it’s possible to pick some parts that came as additional parts with your car, or some discarded parts can be used after upgrading them to performance parts (like a discarded motor mount case that became available after upgrading to an aluminium motor case). 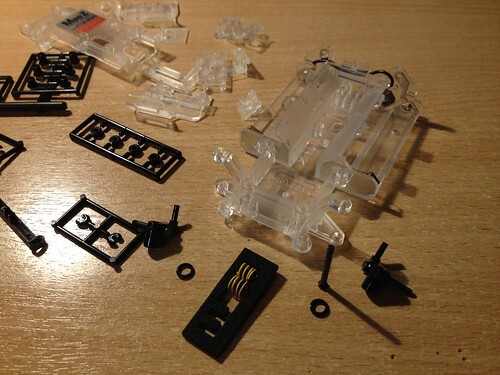 The assembling is a straight forward procedure: what is needed is just to follow assembly instructions or refer to the exploded view form selected car model (chassis, in this case MR-02) user guide. So here are some photos for several build phases. 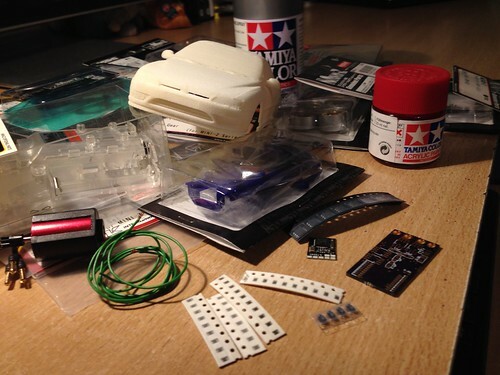 Let’s gather all parts: Here we have all required parts: wheels, chassis, motor mount, servo assembly, suspension, motor, 3d printed car body, PCB for soldering electronics, and electronic components themselves. Here is the other shot: we can see electronic components: PCB, Bluetooth module, resistors, capacitors, MOSFETs and some wire. We also picked some paint for painting a 3d printed body. We will start from assembling a main chassis. 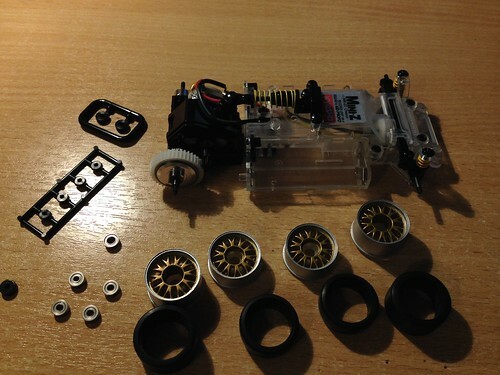 Here is the picture of required components: main chassis, springs for front wheels, front wheel axels, some screws, and some other small plastic parts. Here is the assembled chassis: the wheel axels are in place and top cover is ready. Next step is servo assembly. 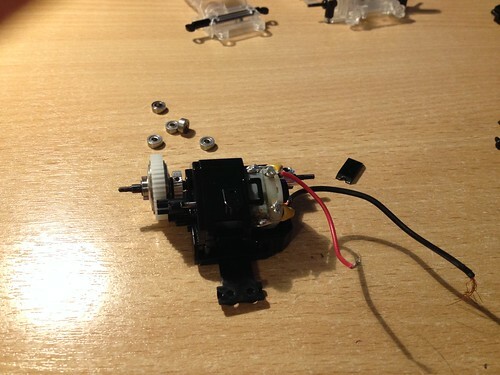 For assembling servo we need: gears, shaft, potentiometer, wires for potentiometer, servo saver, and some plastic parts. The first step involves soldering some wires to the potentiometer. 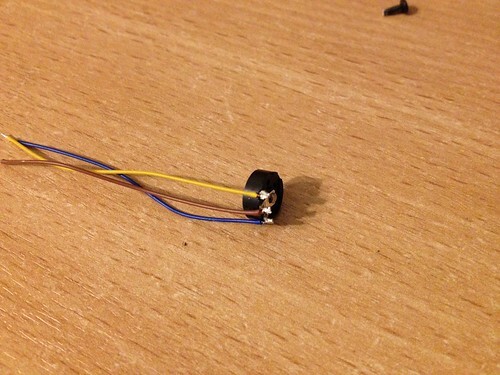 If you have an already assembled Bluetooth board, the potentiometer will be in place. While soldering potentiometer it’s good to have thin wires, as it would be required to route them in a tight path through a servo assembly. 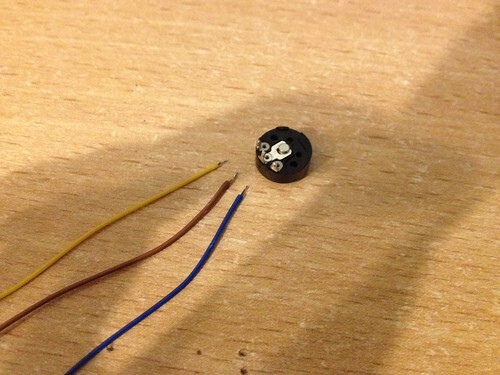 Soldering is straightforward: potentiometer has 3 tabs, we have 3 wires. It’s good to remember that the middle wire (brown) is for potentiometer readings, the first wire (yellow,) will be connected to the 3.3V and the third wire (blue) will be connected to the GND on the Bluetooth board. After soldering we have to cut potentiometer tabs a little bit, as they are too long to fit into servo assembly. Now we have the assembled servo and the installed potentiometer. 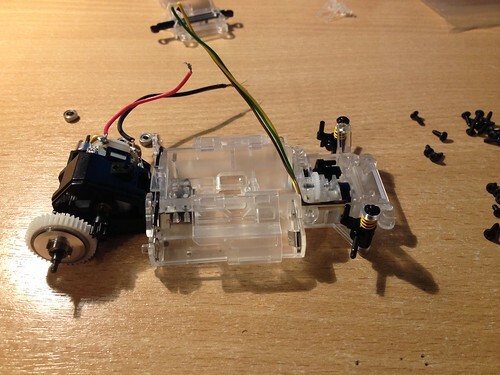 Now we can install the servo into the chassis and route the servo wires. When we have the assembled chassis, it’s time to assemble the motor housing and prepare the motor itself. Here we have middle mound motor casing and some gears. When the motor case is assembled, we can insert the rear wheel shaft. Here we have used a custom shaft and ball bearings instead of some plastic thingies for smoother ride. As the motor is almost ready, we can attach it to the chassis. The next step involves assembling rear shock suspension. It’s a simple assembly – it involves just 3 parts. Now we are almost ready to assembly whole car. 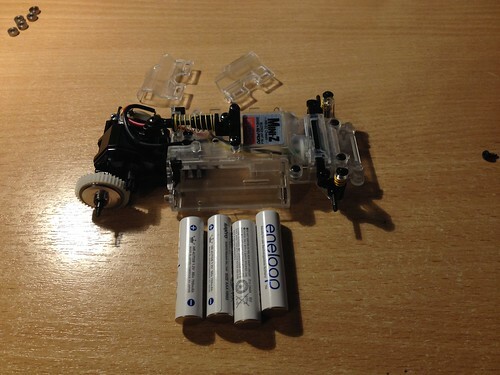 We have chassis with motor connected, rear suspension, and battery connectors. Let’s not forget some batteries as well. Here we have chosen to use some nice looking Eneloop batteries. What about wheels, yes we can now add wheels. Here we have used again ball bearings instead of plastic thingies on the wheels. Wheels assembly is easy – just put tires on, install ball bearings and mount them on the car. Now we can try the body, to see if it fits. Here we can see that wheels are a little bit too wide. Maybe we have to select some other narrower wheels. So now we have the assembled car, but it’s far from running as electronics are missing. CC2541 Bluetooth Smart module, it contains radio part and as well MCU. The MCU is responsible for talking with smartphone (or some other controlling device) and also for controlling steering and throttle. INA220 – device for measuring battery pack voltage and current – those measurements can be used for showing some fancy/fake stats in application screen: how many amperes the motor is drawing at the current time, what is the battery charge level. It will also be used for cutting power on low voltage situations or reducing throttle then batteries are running low. Big p-channel MOSFET – it’s used for disconnecting all power from servo and car motors – thus, it’s possible to leave the car without turning off, and it would go into low power mode (like drawing only 1mA from the battery). NP MOSFETs – for driving servo and car motors, here we have chosen Vishay MOSFETs -the ones with the lowest Rds(on) resistance as we able to find. 3.3V LDO voltage regulator – for supplying power to Bluetooth Smart module. 4.7Komh resistors and NPN transistors for driving servo and motor MOSFETs. As we have designed the board schematics, we can do its layout and order the board to be manufactured at some prototyping company, like OshPark. Here we have some versions of the board. The soldered one is the latest one that has power management MOSFET, the white one is still not assembled, and it’s designed for driving brushless motor (it has 3 NP-MOSFETs instead of 2). The one on the right is the older version, it has no MOSFET for controlling power and thus it’s unable to cut of power then the car is not in use. The OshPark has produced just PCB, and we had to add all components on it. We have used hot air soldering station for soldering all surface mounted components. We had to design a board using SMD components, Mini-Z is really small – the board size has to be no larger than 4x2cm if we want to fit it inside Mini-Z chassis. When we have the soldered board, it’s time to solder the power switch, servo motor, and servo potentiometer. The first step is to prepare the switch. The switch is the angled slide one, and we have to solder the wire that goes from the battery to the centre pin, and the red one should be soldered to the pin that is in “on” position. It’s best to insert the switch into chassis, set it to the on position, and check which pins should be soldered. Then the switch is ready, we have to solder servo motor, potentiometer, ground, and switch wires to the board. Then the board is assembled we have to flash some control firmware. We will use some small pogo pins for flashing it and Tis’ CC Debugger. When the board is ready, all is left is to install into the Mini-Z chassis. As we have control board ready, we can start installing it into the car. The first step is to attach the power switch. As well, we should connect ground and power wires to the battery connection points on the chassis. 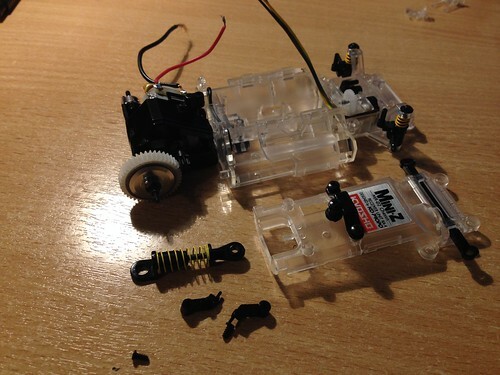 When the switch is in place, it’s a good time to connect motor to the servo assembly and insert servo assembly into the chassis with the motor. 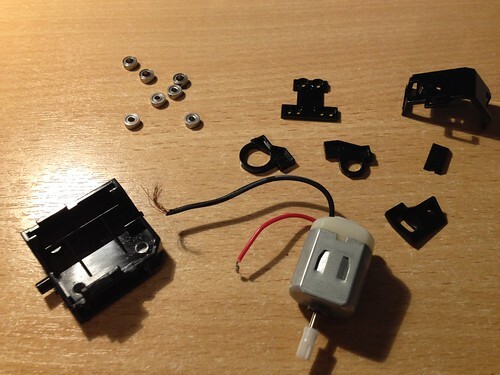 Do not forget to insert the plastic parts that hold motor, insert power switch into its place, and, of course, screw them. When the board is inserted, switch and motor are fastened in their places; we can put the top cover on and connect the motor wires. The car is almost ready. If we would decide to use the regular body, we would have just to attach it to the already assembled chassis and that’s it. But we also decided to build our own chassis for the car we like. 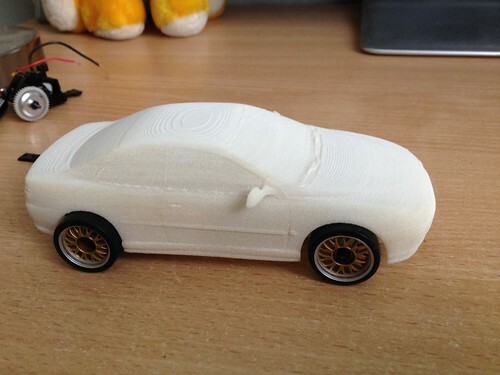 So we have downloaded from the internet the car model of Peugeot 406 coupe, imported it into 3d max, scaled accordingly to fit Mini-Z chassis and ordered it to be printed from Shapeways. The body looks fine on the outside, but it’s not suitable for printing. The models are usually made from meshes and has 0 width wall. But it’s not suitable for a 3d printing – for 3d printing we need models with some walls thickness (Shapways requires walls to be at least 0.8mm width). Also, this body would be used on RC car that constantly crashes into walls, furniture, so it has to be thicker in order to withstand crashes. The model walls ware thickened with modelling tools (Shell tool for 3d max), the mounting places for attaching to the Mini-Z body were added (red and violet fittings). After those modifications, model can be sent for 3d printing. We have selected the elastic plastics in the hope that it could withstand crashes and other bad things. As the body is quite large, the Shapeways does not polish it. So we have just raw body out of printer, what we have to polish it and paint it ourselves. The printed body, indeed, looks nice, but it suffers from a common 3d printing issue: the smooth surfaces are not really smooth. The printing layers are clearly visible. This is really evident on the roof of the car and on bonnet. To overcome this issue the body filler for plastics and hardener was used. This filler for plastic is the same one that is used for repairing real cars (for example fixing the plastic bumpers). With the help of it the layers and gaps on the bonnet were smoothed. The filler was applied a little bit to cover the gaps and then sanded with 240 grit sanding paper to make it smooth. When we have painted body with surface primer and made it ready for painting. The surface primer gave the white look and also filled the small gaps on the body and made it smoother. The roughness of the surface is still visible, as we used filling only for smoothing the top, trunk, and the bonnet where the nasty layers were clearly visible. We decided just to go with leaving unsmoothed surface for other areas. Now the body became ready for painting. So it was just spray painted with a blue colour. The several layers were applied. The final paint was applied with a brush by painting some fine details. Mounting fittings are required for mounting the printed body onto the chassis. We have printed some fittings with a regular 3d printed and glued them into the printed car body. Also one of fittings was attached to the chassis itself with some screws. For this car, instead of using regular receiver we have built iPhone application for controlling the device. The applications are available at Apple App Store. The application allows controlling the car we have just built. The slider is used for adjusting the throttle, and accelerometer is used for steering. When the application is launched, it searches for available cars in the vicinity and presents a list of them. Each our build car can be identified by its personal name. We can select to connect to the desired one (if we have built more than one Mini-Z). The application allows adjusting a steering sensitivity – the maximum turning angles to the left and the right, and also allows adjust a steering centre. The throttle sensitivity can be adjusted as well – the maximum forward and reverse speeds can be selected. The status window can be used for monitor car state – battery voltage, current consumption, and Bluetooth modules’ temperature. So we have built the RC car, installed our electronic, installed iPhone application, and adjusted the control settings. Now we are ready to go racing. Car goes in the opposite direction - Swap motor wires. 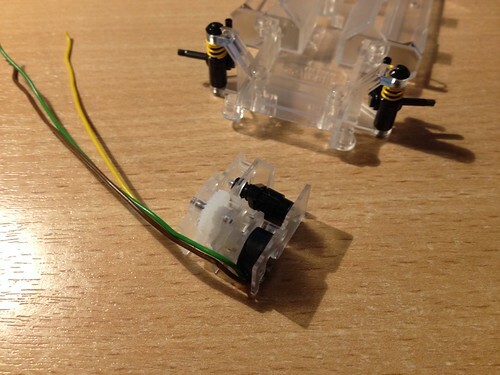 The front wheels turn into the opposite direction and does not go back - Swap servo motor wires. Car does not go - Check if batteries are charged.